While most people are aware of the process and benefits of recycling plastic and paper, no one is talking about recycling electronic waste. What is electronic waste? How does it affect our planet? What can we do to start recycling our electronic devices? 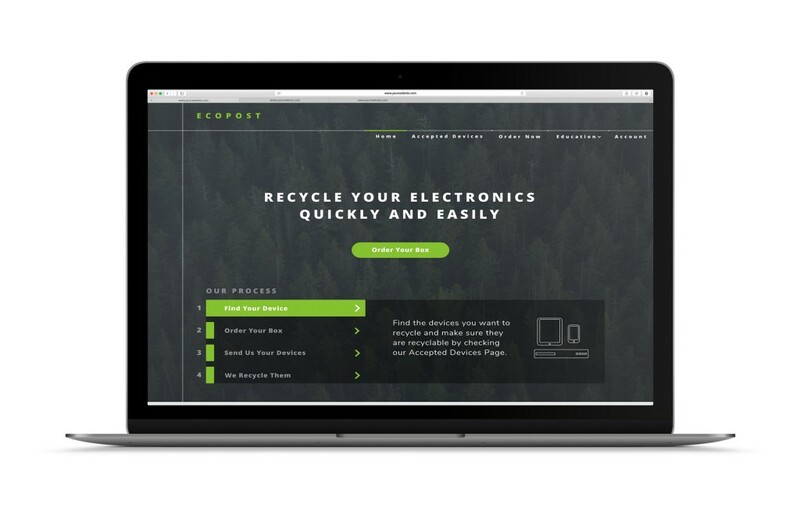 Our goal was to create and design a product that would provide knowledge about electronic waste and offer a convenient solution for recycling electronics. With more education on the topic, we believe people would be more willing to recycle their electronics rather than throwing them in the trash. Electronics have always produced waste, but the quantity and speed of discard has increased rapidly in recent years. Electronic waste is the fastest growing source of waste in the world — and the United States produces more of it than any other country. Although most types of electronics are recyclable, only 12% are actually recycled, according to the EPA. This made it easy to find out what we already knew or things we didn’t know. How often do you upgrade old technology? What do you do with your old technology? What would it take for you to recycle electronics if you don’t already? From this information we formed our persona — Jason Spencer. This persona helped us empathize with our users and understand their goals and frustrations. We all agreed that Jason should be 29 years old, working, and too busy to be bothered with recycling. He does not know much about e-waste and keeps all his old devices in a drawer in his home. From our persona, we were able to create a user story map that provided us with a way to envision the product as a series of tasks that the user completes. We named the main goals of the user, their narratives, and the tasks needed to make the product work. Jason’s top goal was to be more environmentally conscious. We wanted to make sure the user was educated on our topic and had a convenient way to recycle old electronics, all while doing so in a safe and secure way. As we started to sketch out ideas for our web-based application, we kept in mind the importance of convenience and obtaining knowledge on the subject. We wanted to inform users that e-waste recycling can be done easily and responsibly. As a team, we came up with the idea of having a recycling box delivered to the users door. This would solve the problem of inconvenience. The user would first place an order online through our website, requesting either a small, medium, or large box. Once the box arrived, the user would put their old devices in the box, use the shipping label provided, and place it outside their door for pickup. As simple as that. They would also be provided an option to create an account so as to track their item(s) until the devices are properly recycled. If the user did not want to go through our website process, we thought it would be beneficial for our website to have a local drop-off page that would be able to tell users where the nearest electronic recycling facility is located. This information would be available to them once they search by zip code or an address. What are the impacts of electronic waste? With this information, we hoped to not only inform the user about our site and e-waste, but also impact them in such a way that they would want to help the environment and be more environmentally conscious. We also wanted to educate user on data security and knowing that they can still recycle their old cell phones without having their personal information stolen. 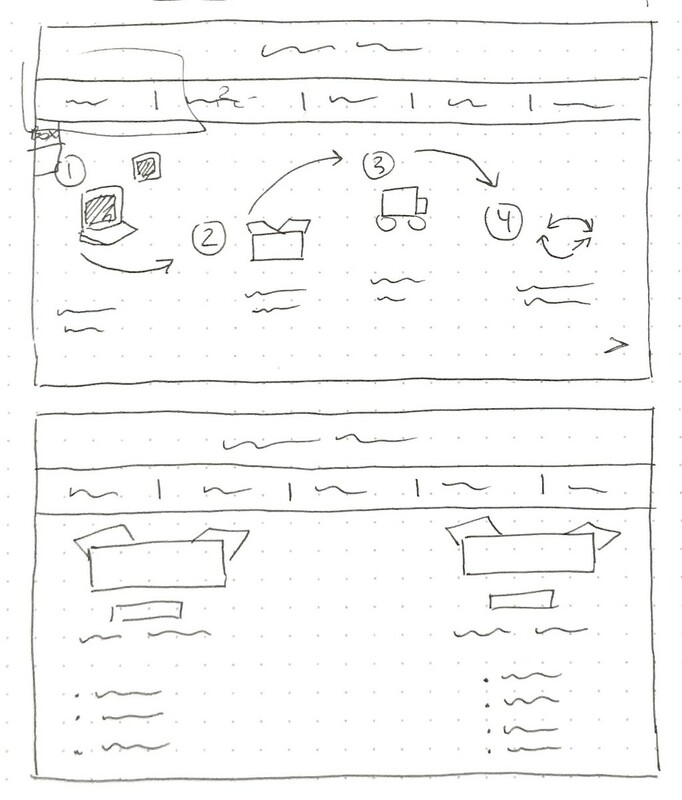 We sketched out a page that had a search bar where users could search for the make and model of phone. Once they selected the specific type of device, a pop-up on the right side of the page would automatically update and give the user a set of steps to follow to properly erase their phone. We started working on creating a homepage that gave you a step-by-step guide on how to use our product. We thought that the best way to display this type of information was to have an icon for each step in our process. Underneath the icon we would describe in detail each step so that the user would not be confused. From there we sketched out the select device type page. This is where the user could pick and choose what devices they wanted to recycle. Base on what devices you selected, our website would then bring up a page that had the box types. One box would be highlighted, indicating that it was the suggested box size from what you clicked on in the previous page. The user would then be brought to a checkout page and be given the opportunity to sign up or log in to track their box. 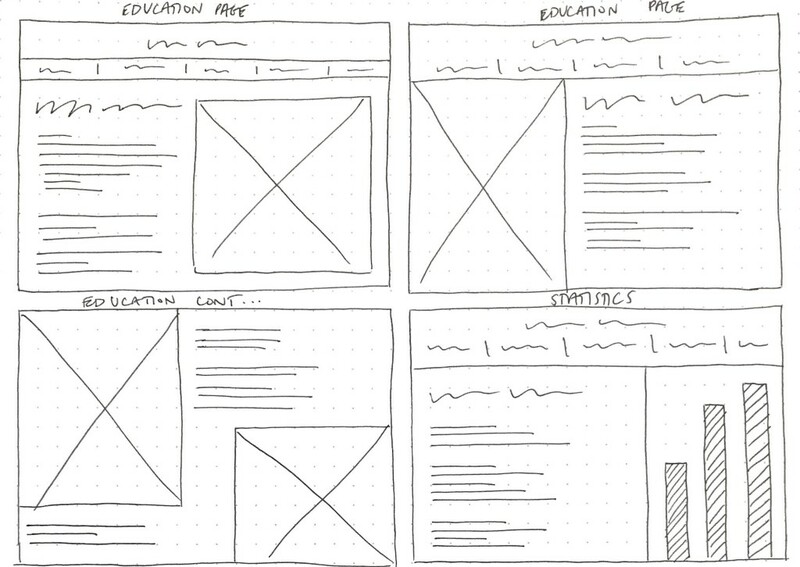 Once we had these ideas down in our wireframes, we went out and had 10 people test on our prototype with a set of tasks that we created. Unfortunately, only 2 people were able to easily navigate our website. What seemed like a convenient step-by-step process to us was not understood by others. Most participants were not aware of the website process and became lost. We soon realized this was because no one was taking the time to read the sentences underneath the icons on the front page. This was the only source of information that walked them though our product. Many had a hard time on our select device page. They were confused when we did not list out a specific model of phone or computer. Because of this confusion, the participants were hesitant to click on the listed devices. When we later asked what could be changed, many suggested not having the option to select since they felt pressured to click the correct devices. Some were confused on the wording of the navigation. One of the tasks asked the user to wipe their iPhone device. The participants did not know to go to the ‘Security’ tab to erase their data. Many decided to either click the ‘Learn More’ tab or looked for additional information on the home page. Based on this feedback, we went back to our wireframes and revised our layout and wording issues. 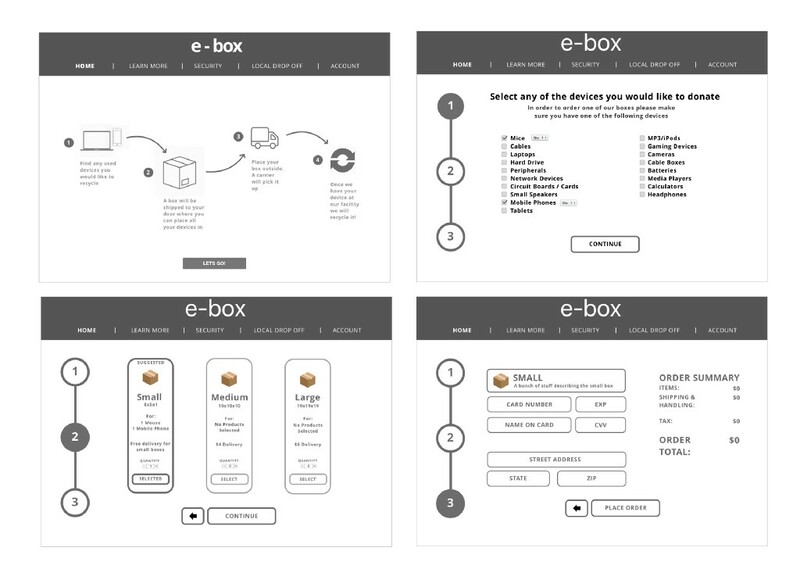 We continued to play with the process pages and eventually came up with a solution for both. However, this did not come easy for the team. We all had different ideas on where to take the home page. Although we all agreed on the content of the page, we all disagreed on what the layout should look like. We ended up branching off and designing the home page individually. Doing this helped us see what ideas each other had and we came up with the solution soon after. The home page became a more interactive layout without heavy wording. This allowed the user to visually walk through the step-by-step process, thus understanding what services our product provided. We removed the ability to select devices on the devices page and instead grouped the recyclable devices into simple categories that were accepted by our product. These groups could not be clicked and was only there to educate the user. The user no longer felt pressured to click on a specific device type. We all learned a lot from working together on this project. It was interesting to see how each of us worked through the UX process and what our strengths and weaknesses were. 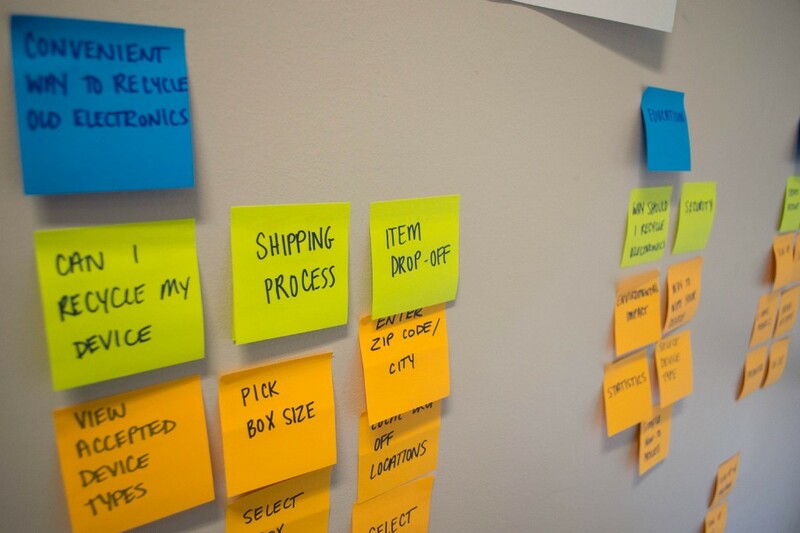 Looking back on our process, we realized we were not spending enough time on our user story map and didn’t refer back to it when we lost track of what was important in our website. Each of us got lost in the visual design process near the end of the project and had to really focus on using each other to come to a solution. Overall, I enjoyed working with my team. We all learned so much over the course of 4 weeks and I am proud of what we were able to accomplish. Thank you for taking the time to read my work. Feel free to connect with me on LinkedIn. UX Case Study: Ecopost was originally published in UX Collective on Medium, where people are continuing the conversation by highlighting and responding to this story.